← What are Credit Ratings Good For? Leading up to the arrival of Hurricane Irene in the Northeast of the US this past Saturday night, officials were sounding the alarm bells in New York City and surrounding areas. New York City has some very low lying areas that can easily flood during storm surges, which were predicted to be particularly bad unless the hurricane changed course. The city itself has very little experience with hurricanes since they don’t usually come this far North, but all indications were that this was going to be bad. Mayor Bloomberg ordered mandatory evacuations of low-lying areas and the entire city’s public transportation system shut down to move the trains and buses to higher elevation. In New Jersey, where I live, we knew that most of our rivers would overflow like they usually do during bad storms. Predictions were for over 12 inches of rain in about as many hours. Flood-prone towns in New Jersey and the entire New Jersey shoreline were evacuated. Most residents of New York city stayed in the city. Several of my friends in New York and New Jersey decided to ride the hurricane out in their vacation homes in the Catskill Mountains, about 2 to 3 hours north of New York City. At the time, this made all the sense in the world. The Catskill Mountains are New York’s playground. Originally named the Kaatskills by the early Dutch settlers, these mountains are more like big rolling hills. Rather than the Rockies or the Alps, you should think “Swiss Countryside” or the Carpathian Mountains of Western Ukraine. They boast skiing, golfing, boating, fishing and have been a retreat for New Yorkers since early in this city’s history. My wife’s parents retired there, as did my grandparents. The mountains are about two to three hours by car from NYC, the last hour of which is a beautiful ride through villages on one-lane roads. There are plenty of creeks, brooks and rivers teaming with fish. Yes, it really is that nice there. So it’s no surprise that many New Yorkers and New Jerseyites (I know, I know) decided to ride out the storm in their mountain homes. The eye of the hurricane was predicted to hit Manhattan or possibly a few miles east on Long Island. One friend in particular left her Lower East Side apartment to go to her recently purchased house in Prattsville, NY. What could be safer than being 100 miles inland at an altitude of 3,000 feet? Irene’s eye did indeed make landfall just east of New York City in Coney Island. Hurricane strength winds did arrive, but it was the rain to the west of the eye that caused the real trouble. In New Jersey, we got the promised 14 inches of rain in the short interval. That rain created plenty of new temporary ponds, flooded the usual rivers, and was absorbed by the ground to re-emerge in many of my friends’ and neighbors’ basements. This is all because most of New Jersey is flat, so the water had enough time to sit and soak into the soil. NYC also seemed to be spared, but probably because the city is already accustomed to pumping out its subway system. The Catskills, though, are a different story. There, the water ran off the sides of the mountains into the valleys – right where those beautiful villages were built. The roads in the area follow geographical contours to make travel easier. Those same contours are also the ‘path of least resistance’ for water to follow downhill. The photo, taken by my brother-in-law, shows one of several bridges that were overrun (click the photo to enlarge). Many of them were simply washed away. Houses and building in Prattsville, where my friend stayed in her home, were flooded and many were destroyed. Although my friend’s house was spared, she did have to be rescued by the National Guard. 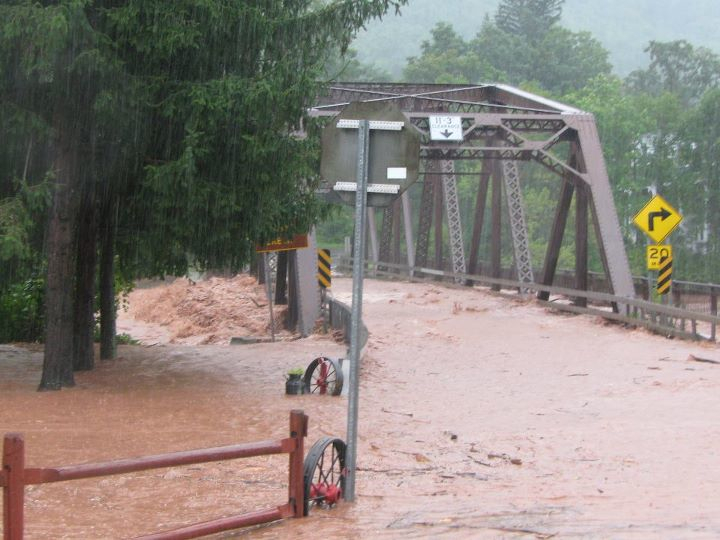 In other nearby towns – Windham and Hunter, for instance – road surfaces, bridges and buildings were washed away. People who decided to practice “good risk management” by leaving the low-lying areas of NYC and New Jersey and riding out the storm in the mountains of New York State were instead hit much harder than they would have been if they had stayed in the “riskier” low-lying area. Like I was saying…Sometimes hedges just don’t work. I definitely haven’t found any worthwhile posts like yours. In my opinion, if all web site developers and blog owners produced ideal articles as you have, the web will be a lot more beneficial than at any time before. Enjoyed your message, yet somewhat perplexed by your use of the word “hedging ” to describe the situation in Catskills. Then again maybe I’m hedging. The hedging was meant to refer to the act of evacuating NJ and NYC and choosing to ride the storm out in the Catskills. People thought they were reducing their risk, hence a ‘hedge’ against the storm. No one sold their NYC or NJ house to move to the mountains, so it’s not the same as a financial hedge, but it’s more a hedge in the vernacular use of the word.